Saint Glykeria was from Novgorod, the daughter of Panteleimon, a public official of Legoscha Street in Novgorod. The only thing we know about her is that she died in the year 1522. However, according to the second Novgorod Chronicle, fifty years after her death, on the 14th of July in 1572, after a woman recalled to Archbishop Leonid of Novgorod that fifty years prior she had received healing when Glykeria was buried, the coffin of Glykeria was found behind the Church of the Holy Martyrs Florus and Laurus, and her relic was incorrupt. After the coffin was opened, Archbishop Leonid of Novgorod solemnly put the relic of the Saint in the Church of the Holy Martyrs Florus and Laurus. On the same day, a four-year-old boy named Bogdan Suvorov was healed from an illness under the coffin of the Glykeria, after which there followed other healings. These healings became the basis for her veneration and canonization. In the Tikhvin Church of the Moscow Simonov Monastery in the middle of the nineteenth century, a chapel in honor of Saint Glykeria was built. 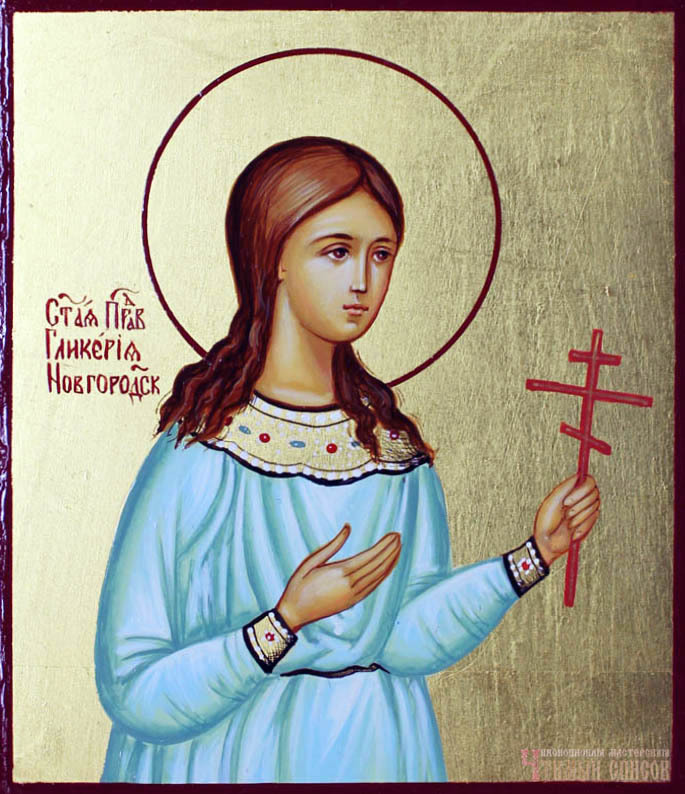 After the Revolution of 1917, we have no knowledge of the location of the relics of Saint Glykeria.